Today, Friday August 10th, is the last day of the NRA Individual High Power Championships. Heading into the last day, Carl Bernosky (2011 Champ) and SGT Sherri Gallager (2010 Champ) are tied on points at 1795, while Carl has five more Xs. This is a tight battle. There are three matches left to shoot: Crescent Cup (slow fire, standing, 200 yards); Cavalry Cup (rapid fire, prone, 300 yards); and Crowell Trophy (slow fire, prone, 600 yards). This Championship should go down to the wire. Carl is one of the best standing shooters in history, so he should do well in the Crescent Cup, while Sherri is a long-range wizard so we can expect her to do well in the 600-yard Crowell Trophy match. What’s more, Sherri is shooting a .260 Remington which may offer better ballistics at 600 than Bernosky’s 6mm Hagar. FYI, on Thursday, Gallagher shot superbly in the 600-yard Air Force Cup match — her 200-17X score was just one X shy of the National Record (which was set by Sherri’s mother, Nancy Tompkins). Gallagher’s showing in the Air Force Cup helped close the gap between her and leader Carl Bernosky. The two shooters are slowly pulling away from the rest of the pack, although there is the possibility of another winner if one of the leaders has a real disaster. SSG Brandon Green and Rodrigo Rosa are both just three points back from the leaders (Green has more Xs than Rosa though). The high Service Rifle shooter is still SSG Tyrel Cooper, who has a 1787-71X score. Ty’s score is remarkable considering his AR-platform rifle has relatively crude military sights and non-adjustable buttstock. Share the post "Individual High Power Championship — It’s Down to X-Count"
Great Britain’s Richard Jeens won the Individual World Long Range Full-Bore Rifle Championship in Brisbane, Australia with a final score of 725-49V. (A “V” is a center-ring hit, equivalent to an “X” in American matches). Ceremonially hoisted in the air by his fellow competitors at the awards ceremony, Jeens was all smiles, having earned a title he’ll retain until the next World Championships in 2015. Jeens topped a field of 374 shooters from seven countries. Andre Du Toit of South Africa took the Silver Medal after a shoot-off for 2nd/3rd position against bronze-medal winner David Luckman of Great Britain. CLICK HERE for complete results. Finishing 5th overall in the Three-Day Aggregate, Jeens had to rely on his shooting skills (plus a little bit of luck) to win the shoot-off (the top ten competitors after three days of competition advance to a final shoot-off.) The little bit of luck came by way of the winds during the 1,000-yard phase of the competition. Long Range shooters usually deal with all sorts of conditions, but the day’s wind was enough to knock a few of the favorites (such as SGT Sherri Gallagher) out of the Top Ten. Nonetheless, it was a well-deserved win, and we congratulate Richard on his achievement. Looking at Richard’s winning rifle, we surmise his victory settles the question whether a thumb-hole stock will work for long-range prone shooting — it seemed to suit Jeens just fine. Jeens wasn’t the only hot-shooting marksman from Great Britain in the competition. Fellow Brit David Luckman shot a 723-68V, matching South African Andre Du Toit for the second highest score (Du Toit then prevailed in a shoot-off for second place). Only 4 Vs behind her team-mate Luckman, Great Britain’s Jane Messer finished fourth with 723-62V. Notably, three women finished in the Top 10, led by Messer, with Americans Trudie Fay and Nancy Tompkins in sixth and tenth, respectively. Heading into the final day of the Individual Championships, Nancy’s daughter SGT Sherri Gallagher was in the lead, but she dropped points in the very windy conditions on the last day. Photo Credit: US Palma Team member Dave Cloft. Report by Lars Dalseide for The NRA Blog. 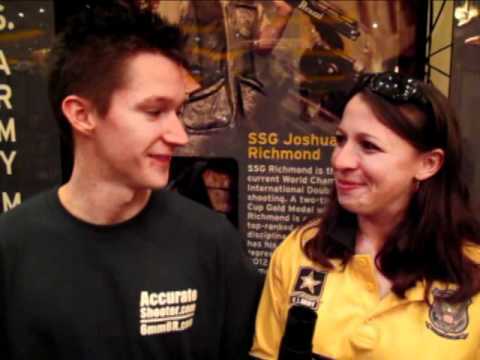 Share the post "Britain’s Richard Jeens Wins World Long Range Rifle Title"
The 2011 CMP Eastern Games and Creedmoor Cup Matches took place the first week of May at Camp Butner, NC. The overall winner (no surprise) was current NRA National High Power Champion SGT Sherri Gallagher, who tallied a spectacular 797-50X. Finishing second was fellow USAMU shooter SSG Tyrell Cooper, with 794-41X. Sherri also had the highest individual score, 499-29X, in the 4-person Team Event. Sherri showed, once again, that she leads the field in High Power Match Rifle shooting. When Sherri is “on her game”, she’s hard to beat. You can see a large collection of Eastern Games photos from the Garand and Springfield matches (on Day 1) at the CMP online photo archive. Sean Leighton won the Garand Match (289-3X) AND the Springfield Match (290-9X), and had the highest Three-Gun Aggregate with an 870-15X combined score. Great shooting Sean! In other specialty matches, Ken Lygren won the Carbine Match (356-1X), Doug Armstrong won the individual Vintage Sniper match (194-6X), and William Flagg Jr. won the Rimfire Sporter match. In 4-person team competition, USAMU teams took both Service Rifle (Craig Team, 1967-74X) and Match Rifle Divisions (Praslick	Team, 1991-103X). Complete results are found on the CMP Competition Tracker webpage. This includes Rifle Match Scores and Pistol Match Scores. Share the post "Match Report: Eastern CMP Games and Creedmoor Cup"